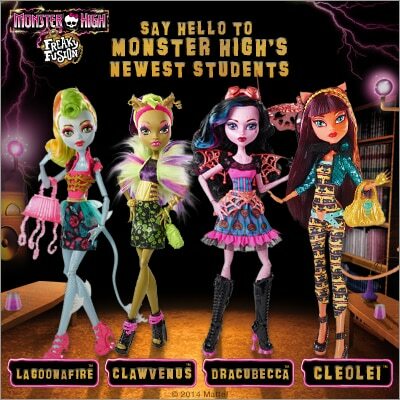 Monster High has a new blend of ghoulishly gorgeous students. Monster High Freaky Fusion Dolls are here. Get to know the Freaky Fusion crew, Clawvenus™, Cleolei™, Dracubecca™ and Lagoonafire™. This post is sponsored by Lunchbox, all opinions are my own. The story behind these new ghouls starts with Frankie. While trying to learn more about her past and family scaritage, she accidentally travels back into the year 1814. There she meets Sparky, a misguided teen who’s obsessed with the creation of life. He ends up following Frankie back to present day Monster High, causing a lab accident that fuses eight ghouls in to four new monsters. Visit Walmart.com to get all the latest Freaky Fusion™ ghouls. Clawvenus™: Made up of Clawdeen Wolf® and Venus Mc Flytrap® – Clawvenus™ is fiercely “fusionable” and ferociously beautiful, but she may need to change her shampoo to a weed-and-feed formula. Cleolei™ (Pronounced “Cleo-Lie”): Fusing the Mummy heritage of Cleo de Nile® with the werecat ancestry of Toralei®, Cleolei™ has some ferocious issues, but it’s nothing a quick little cat-nap won’t fix. Dracubecca™: Mixing the Vampire heritage of Draculaura® with the Mad Scientist ancestry of Robecca Steam®, Dracubecca™ is scary sweet but still attached to rocket-powered boots. Lagoonafire™: Fusing the Sea Monster heritage of Lagoona Blue® with the Chinese Dragon ancestry of Jinafire Long™ Lagoonafire™ loves to surf and swim like she’s on fire — literally! Which Ghoul are You Most Like? Take the dual ghoul personality test! Are you most like Cleo de Nile® or Toralei®? Draculaura® or Robecca Steam®? Lagoona Blue® or Jinafire Long™? Clawdeen Wolf ®or Venus Mc Flytrap®? 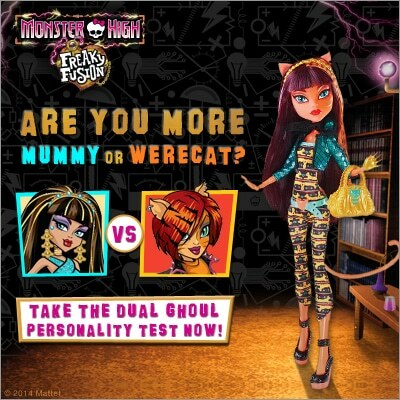 Find out by taking the fun quiz on the Monster High® Freaky Fusion™ page. By choosing between “this” or “that” picture, you and your little ghoul can find out your Freaky Fusion™ percentage. Explore the creepy cool and spooky surroundings of the Monster High® Catacombs! 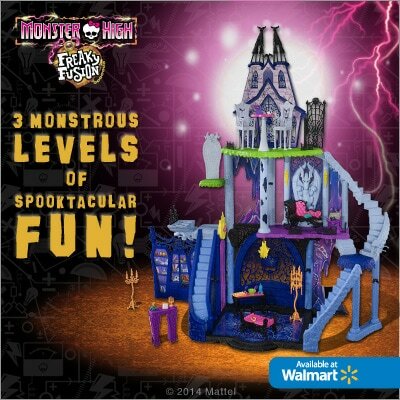 Fang out with all your fave ghouls in this monstrous 3’ x 4’ play set packed with clawesome transformative features and secret surprises. Take the test and let me know which ghoul you get in the comments below! Those dolls have always freaked me out a bit. However, I know they are a hit with the girls these days. I like Cleolei best! Cool, I got Cleolei! My daughter loves the new fusions, she just did a video for them for my youtube channel in fact. I know what she wants for Christmas!! Monster High has some cute dolls, and these are perfect for Halloween! I love the play set, looks super cool for a my niece. That castle looks so cool. I know a lot of kids who would like it! These dolls are SO cute. Halloween is my favorite holiday— it’s SO much fun! These are the perfect toys for the holiday. My daughter has been asking about these lately. I was going to look for them for Christmas. This is just great. We purchased the movie when it came out and watched it that night. Since then, we have purchased all the rest of the movies… we just love them! Looks like a very interesting product line. I like the colors on their outfits. Oh I know a few girls who would just die for some of these dolls! So much fun! My daughter will want these if she sees them. They are a little scary and stylish all at the same time. My niece loves the Monster high dolls. She’s always looking for new dolls,playsets and accessories. I love the castle! I am 75% Draculora… we love these movies and the girls have most of those toys and dolls on their holiday wish list! Those freaky fusion dolls seem fun for preteens!